Brad Parbs is a core contributor, plugin author, theme designer, open source fanatic, and startup lover. 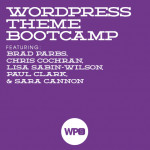 Brad has created open source WordPress tools, themes, and plugins. Brad currently a developer at WebDev Studios. When not making things with WordPress, Brad drinks Chai Tea, plays with his cats, and listens to loud music in his car.